OBDLink MX+ is a Bluetooth obd2 scanner that can diagnose your car and display error codes if it finds an error. It can be used wirelessly and supports Android, iOS, and Windows devices. The tool works by syncing it with one of many supported apps including the device’s own OBDLink app that works quite well. It’s a small scanner and occupies little space under your car’s dashboard. OBDLink MX+ is one of the best OBD2 scanners supporting all mobile devices and a wide range of vehicles. You can use it on multiple cars and enjoy great results as it covers several basic and advanced features. OBDLink MX Plus can do a variety of things such as read and clear check engine light codes, check codes for ABS and SRS in a wide variety of vehicles, show fuel usage, offer TPMS, and more. 1 Why Should I Choose OBDLink MX+? 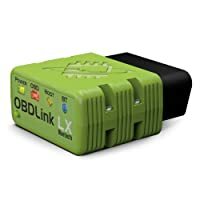 Why Should I Choose OBDLink MX+? There are many obd2 wireless scanners on the market but few are as powerful as the OBDLink MX Plus. OBDLink MX+ offers 4X more data per seconds compared to its rivals and is said to be 300% faster compared than rival scanners. This obd2 scan tool is able to bear overvoltage and doesn’t fry up. Moreover, it automatically goes to sleep when you turn on the engine so that the battery doesn’t drain quickly. Some of the most important features of a car are its anti-lock braking and airbag systems. ABS is responsible for ceasing rotation by preventing the tires from locking up so that they do not skid. On the other hand, SRS is related to the airbag system. It signals you about the airbag system and ensures it deploys in case of an emergency. Both of these features are crucial for a driver’s safety which is why most of the modern cars (1996 and beyond) light up the engine light when there’s something wrong with the ABS and SRS. OBDLink MX plus is capable of reading all ABS and SRS related codes and tell you if they are functioning properly or not. The tire pressure monitoring system monitors air pressure (TPMS) inside the tires and signals you if it’s low. This helps prevent accidents and also helps ensure you enjoy a good ride. The ABS system comes with sensors. They monitor the rotational speed of each wheel and display live data on the screen. This helps you know how well the wheels are performing while also informing you about the pressure. The TPMS light turns on if the tires are not properly inflated. You can fill them up to prevent wear and tear. When you drive a car, you will have several questions regarding it, especially if you notice the performance deteriorating over time. It’s a natural process. It doesn’t matter which car you drive, it will begin to show errors after a while. A good thing about most recent cars is that they indicate problems with an engine light but you will need a scanner to understand these lights. OBDLink MX+ can read these lights and also help you clear ‘em. It allows you to keep an eye on the current transmission temperature of your engine so that you know it’s not overheating. You can also customize the dashboard and keep the features on top that you frequently use. This will make it easier for you to keep an eye on things. Fuel economy of OBDLink MX+ helps you understand how economical your vehicle is. In addition to this, it can help you understand how economical your vehicle is by measuring fuel economy. It can help you calculate the cost of a trip and also allow you to understand the optimum speed of your vehicle. Moreover, the tool can do more depending on the app that you use. We suggest you check multiple apps and pick ones that offer the features that you are interested in. For example, Torque lets you lock/unlock doors or remote start the engine. However, it works in a few vehicles only. Once you get your hands on OBDLink MX+, you will not have to worry about compatibility as it is one of the few scanners that support different OS including Android, iOS, and even Windows. You can use it with its own app or try it with a third-party app as it supports several third-party tools as well. 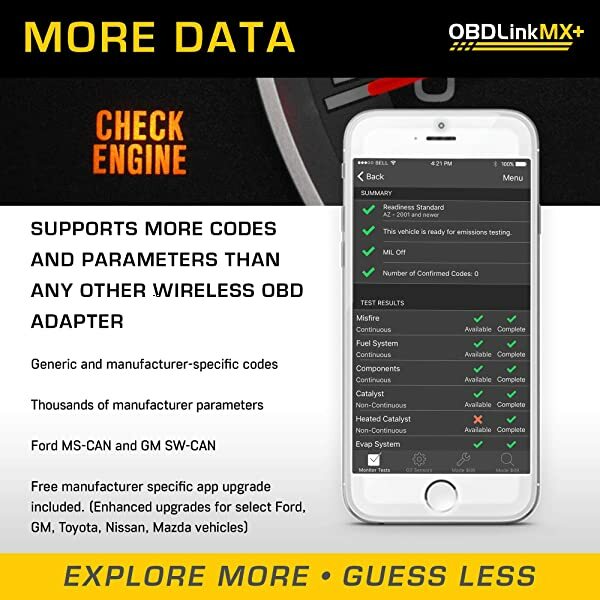 OBDLink MX+ offers iOS compatibility with GM LAN and Ford MS-CAN. Note: This is one of the few obd2 scanners that offer iOS compatibility with GM LAN and Ford MS-CAN. It supports EOBD, JOBD and OBD2 supported cars. A very good thing about this tool is its ability to support third-party apps. This can be a great feature, especially if you have been using a specific app for a while and recently shifted to OBDLink MX+. You can continue to use the same app while enjoying improved performance. OBDLink Plus can work with dozens of apps such as OBDLink MX, Dashcommand, Forscan, Torque, etc. Our personal favorites with this tool are OBDLink or Torque. 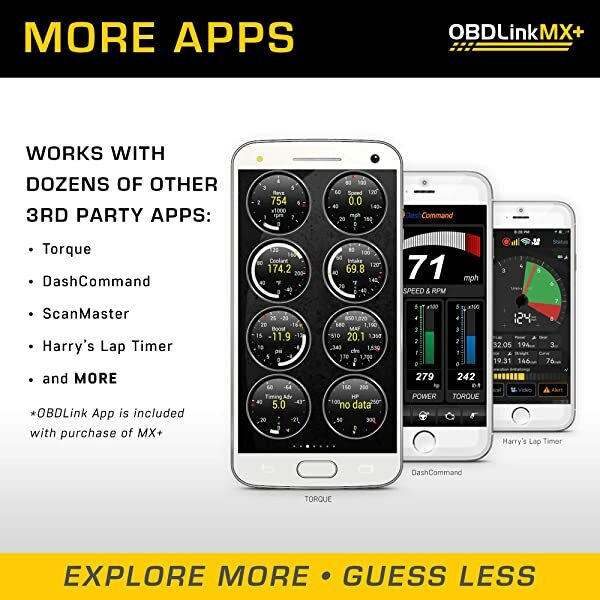 OBDLink Plus can work with dozens of apps such as OBDLink MX, Dashcommand, Forscan, Torque. Both of these apps offer many features such as door lock/unlock, ABS, SRS, read live data, remote start/turn off the engine, etc. You need to install an app and connect it to the scanner via Bluetooth. Put your worries to rest as the tool offers great security against hackers. Wireless scanners are prone to hacking if they have an easy 4 digit pin code access. However, this one comes with a strong encryption system that is hard to break into. With this one, you will not have to worry about someone getting access to your car. The company does not only offer a 90-day money back guarantee, but a 3-year warranty as well to provide you with peace of mind. Technology changes at a rapid pace and so do solutions. With this tool, you will not have to worry about updates since it allows you to download and install updates for free. The company introduces new firmware updates to resolve bugs and make it more reliable. Moreover, you can also enjoy free technical support from the company. OBDLink MX+ has a 90-day money back guarantee to provide users with peace of mind. Is not easy to hack. Shows real-time fuel consumption display. Use in multiple vehicles (make a separate profile on each car). Buy an enhanced add-on to access manufacturer specific data. (around $9.99/ add-on). 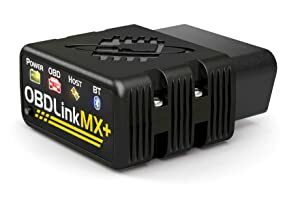 Bottom line OBDLink MX+ supports all mobile devices and a wide range of vehicles. You can use it on multiple cars and enjoy great results as it covers several basic and advanced features. 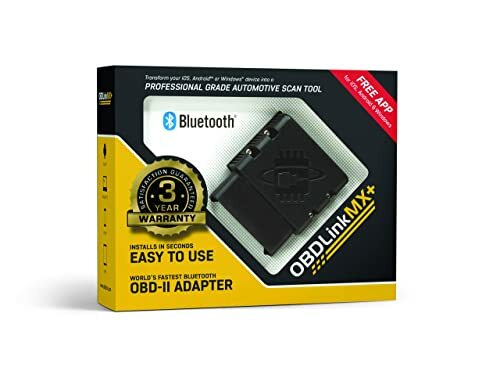 OBDLink MX Bluetooth is is recommended for Android and Windows PC because it is engineered to accelerate performance up to four times faster than the closest competitor. OBDLink LX is engineered to provide outstanding performances with intelligent sleep mode, hacker-proof security, exceptional third party app support. 1. Which cars does the OBDLink MX Plus support? 2. Will It Read ABS and SRS in my car? So far, this scanner offers ABS and SRS in Ford, Lexus, Mazda, Toyota, Scion, Lincoln, Mercury, Nissan, Infiniti, GMC, Buick, Cadillac, and Chevrolet. 3. Will it support Hybrid and Electric vehicles? Unfortunately, it does not support hybrid and/or electric cars. 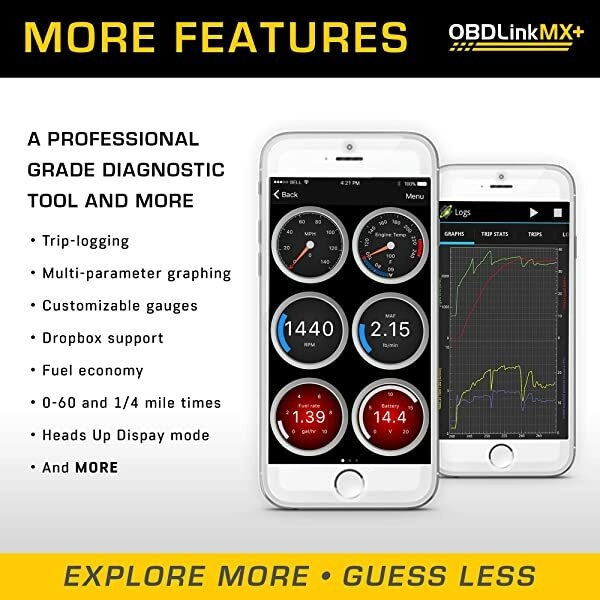 OBDLink MX+ is a scanner for DIYers and beginner mechanics as it offers real live data reading, reads and clears ABS/SRS codes, TPMS etc. 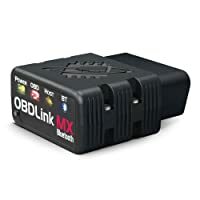 OBDLink MX+ is one of the best OBD2 scanners on the market. It supports all mobile devices and a wide range of vehicles, too. Plus, you can use it on multiple cars and enjoy great results as it covers several basic and advanced features.